By clicking on this thread, you acknowledge that you have been warned about the quantity and size of the images contained herein! So, I was taking pictures of my T42p so that I could put it up for sale, and since I had my camera out and was taking pictures of laptops, I had an idea...put my T42p and T60p side-by-side and do some comparison/contrast shots! If this doesn't qualify me as a nerd, I don't know what does. So, without further ado...IBM ThinkPad T42p vs. Lenovo ThinkPad T60p! I don't know...I didn't see a KO here. They both held their own. It's a toss-up! Note from Moderator: Warning or no warning, images should be <50k. If anything the thing that strikes me is how similar they are, not different. The T42 is slightly thicker ... Interesting, thanks for sharing the Pics. Harryc wrote: If anything the thing that strikes me is how similar they are, not different. Not that I'm complaining or anything. I was already a big fan of the ThinkPad T-series aesthetic before I upgraded to the T60p. 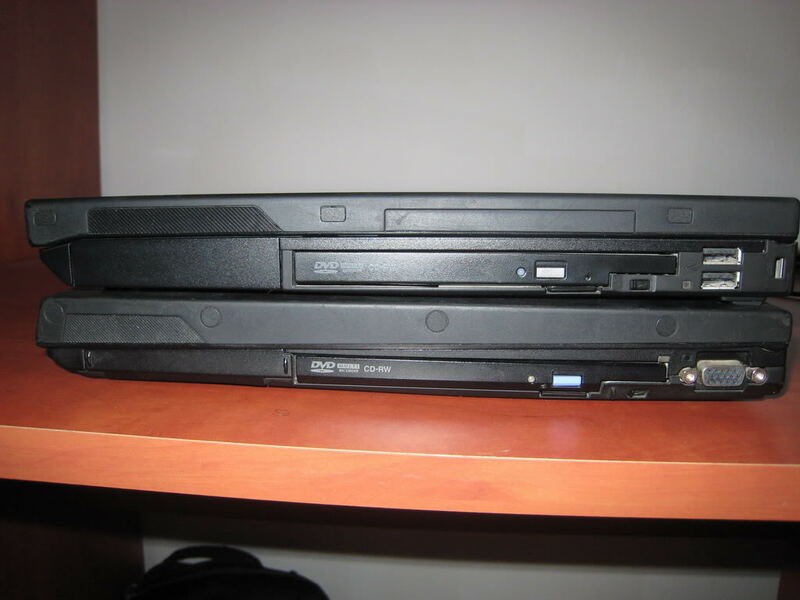 Actually, that must just be an optical illusion of some kind, because they are both EXACTLY the same height, both with the LCDs are closed as well as when they are open (so the bases are the same thickness, and the laptops as a whole are the same thickness when closed). It's quite remarkable. Great shots! They look like twins, seriously. How is OS X running on the T60? Is it a hazzle to install? Looked it up some time ago, but it seemed there were lots of problems with drivers and just getting the whole featureset of the T60 working in general. Those are great pictures of your twins. Thanks! Beautiful pictures, and the T42p looks as good as new! Thanks for the comparison shots... haven't pulled myself together to do some proper photographs myself yet. HarryC, I had a 15" T42 and upgraded to the same T60p NathanA has and it literally took 6 hours before my colleagues saw that i got a new laptop. I didn't tell them anything beforehand. thanks for the pic that interesting to see! Be sure to check out my CONTEST! 1) Have you weighed them? I'd like to know their exact weights. 2) Both have UXGA Flexview, right? Is the T60p's screen better than the T42p's, or do they look identical? pianowizard wrote: 1) Have you weighed them? I'd like to know their exact weights. 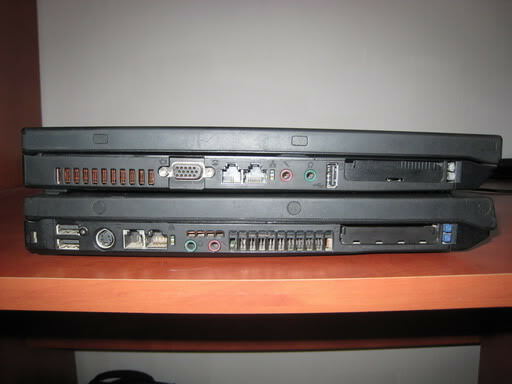 pianowizard wrote: 2) Both have UXGA Flexview, right? Is the T60p's screen better than the T42p's, or do they look identical? Great pictures and congrats on owning such fine machines. 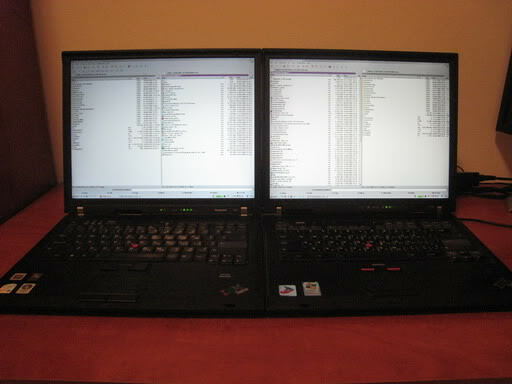 As others have pointed out, the 15" T42 and 15" T60 models are cosmetically very similar, practically twins. I was quite relieved to discover this on my own as I upgraded from a T42 15" FlexView SXGA+ to a T60 15" FlexView SXGA+ model (2379-DXU to 2007-5BU). You can barely tell the models apart, they are identically sized and designed - why mess with success! However, the performance increase is noticeable! Regading the 14" models, this is not the case, it's much easier to tell the T4x's apart from the T60's. For 14" models, I still prefer the T4x design. On the T60P , what is the black thing on the side of the LCD? Maybe some sort of antenna? Really great pic's - it's nice to see the subtle differences between the two, you've covered every angle - Would like to see a T60p 14.1" and T61p 14.1" side by side, taken from the same angles as yours. 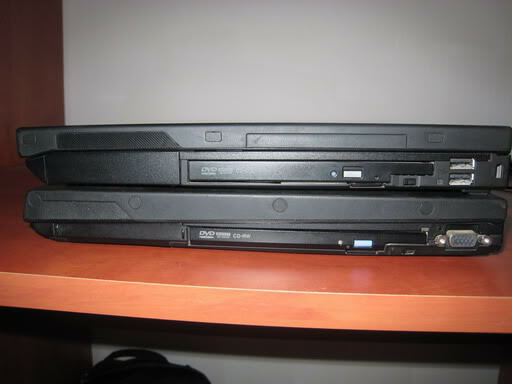 A photo of 14.1" models. 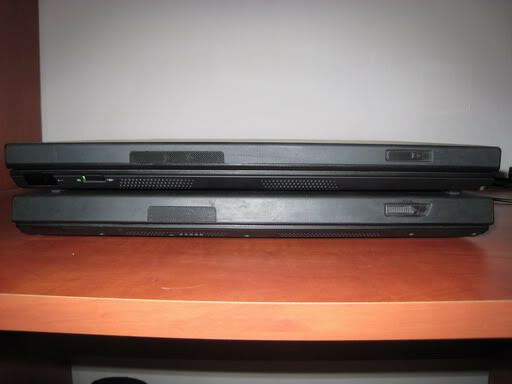 The left is a T43 and the right is a T60p. Sorry Peak2Peak I don't have a T61p but it would be mostly identical to the T60p I think. I wanted to do a comparison of my 15" T42 and T60, as I currently have them both next to each other (whereas normally they are in different houses). Then I remembered that a while ago I've seen this thread with excellent comparative photos by NathanA, and so instead of starting a new one, I'll just augment it. Front: T60 has hardware WiFi switch, T42 does not. Both have IR port (finally discontinued in T61). 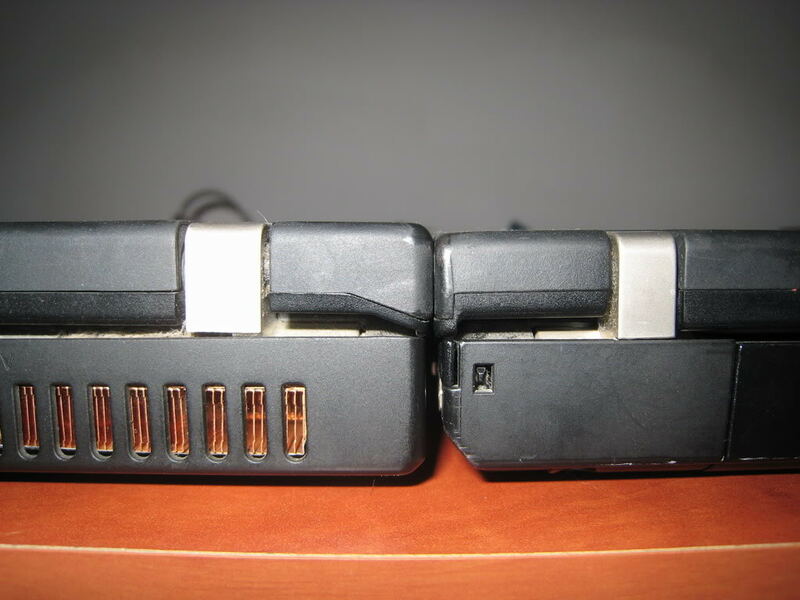 Back: Parallel port in T42 was ditched in favor of extra vent in T60. Left: Somewhat different arrangement of ports. And different top lid design (angled on T42, straight on T60). If you look at the surface of the lid from the top, you can think that the T42 is slightly shorter, but because the lid is angled, actual footprint is the same. Right: Curved bezel on T42, straight on T60. The optical drives are compatible, though, even if they won't quite fit flush with the wrong bezel. T42 lid design is interesting on this side, it goes diagonally straight down creating the illusion of a very thin base, and an extended clamshell effect. 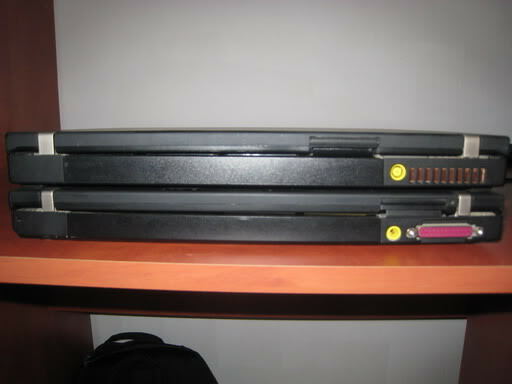 T60 (left) is ever so slightly thicker[/url]. However it is not heavier at all, even a bit lighter (due to the optical drive I think). I like both laptops a lot. Putting the obvious advantages of the T60 in hardware and construction (rollcage), both have their advantages. * Simplicity of memory upgrade - the second slot is at the bottom, accessible easily by one screw. The primary slot under the keyboard also requires just 3 screws. For T60 both slots are under the palmrest, which requires four screws to remove, and putting it back is a bit trickier. * Design - I really like the clean simple symmetric design of the T60. However something about the notches of the T42 does give it a special feel, and makes it look slim and curvy in comparison. They are really both very nice. Last edited by dr_st on Sat Oct 07, 2017 7:23 am, edited 1 time in total. Finally, someone on this forum who also likes the Windows key! For me, this key is most helpful when I am doing something in full-screen mode (example watching a video) and need to access the Windows Taskbar.